Originally posted Jun 21st 2011. Updated with new information. Of course, before you can start seeing results like that, you’re going to need to obtain a very specific set of skills and techniques first. This industry is constantly evolving, with new technologies and new trends opening up a whole new world of possibilities – if you know how to use them. 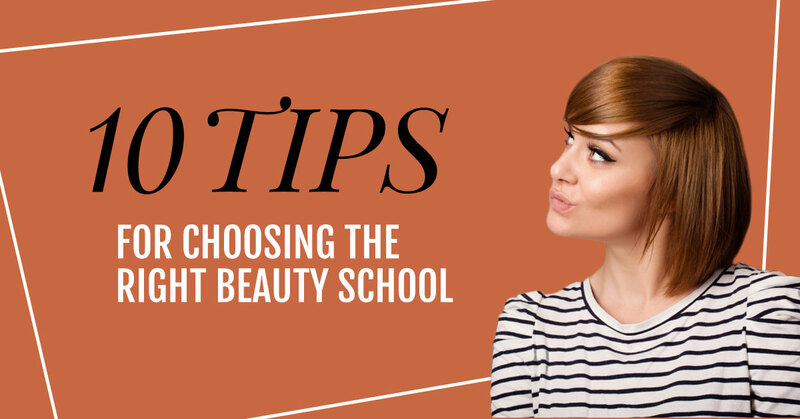 Getting into this industry means building on a strong education, which is why it’s so important to understand what you’ll find in the best beauty schools and how to use that information to reach your goals. The following ten tips can help you determine how to choose a hair school that will put you on a path to a successful career. From makeup artistry to cosmetology, there are a lot of options available for new students. You can start exploring the different courses offered by the school at basic level. This will at least let you see whether or not the school even offers the classes you are interested in (and whether or not they can help you reach your career goals). While that’s a good start, you shouldn’t end there. Now it’s time to delve a little further and find out exactly what the curriculum includes. Do they offer hands-on experience in these classes? Do they have the latest technology related to these programs? Do they offer the classes when you can fit them in your schedule? Get all the details before committing to a class. A virtual tour isn’t good enough. Take the opportunity to get a tour of the campus and really get a feel for the place in person. You can see for yourself how up-to-date the campus really is and make sure the overall atmosphere is appealing to you. There’s more to this trip than just the campus, though. You should make sure the commute is reasonable and then look around the area to see if parking will be a struggle or if there are some conveniences around the neighborhood that will make the experience more enjoyable. How much support does the school offer after your coursework has been completed? More importantly, does the curriculum start you on the path to managing a successful career? A beauty school should also be a business school (to some point). When you graduate and go out into your own job – or possibly your own salon – you will need to augment your talents with some everyday business know how to keep the place running profitably. So, don’t just look at the hair school and check to make sure they offer business management, finance, and customer care classes, too. Your school should be clear and upfront about all tuition costs, so nothing comes as a surprise. You should also take the opportunity to find out if there are any scholarships or other financial aid programs available. While you shouldn’t choose your beauty school based solely on the price, you need to make sure that you see real value for the cost of your tuition. A good cosmetology school will bring in the industry’s brightest minds to instruct their students. World-famous salon professionals visit Taylor Andrews year-round. Past artists have included Phillip Wilson, Vivienne MacKinder, Nicholas French, Faatemah Ampey, and Brian and Sandra Smith. Different curriculums start at different times throughout the year. Find out when the next round of coursework begins and make sure it fits into your schedule. You may have to wait until the classes begin again, and that’s fine too, because you don’t want to overdo it and stress yourself out too much. You will want to make the most of your time in beauty school. Check out the times that your classes are offered because you may be able to get the classes at night and work them around your current job schedule. It’s also important to be aware just how long the coursework lasts so you’ll know how long you’ll be committed to this path. Your cosmetology school should have a history of high graduate job-placement and openly inform you about the credentials and experience of its owners and instructors. Taylor Andrews students are successful from Los Angeles to New York. Students should be cutting hair in a hands-on setting as frequently as possible. At Taylor Andrews, we focus on giving our students the experience needed to succeed, and our externship program gives you the chance to work in the area’s top salons while still in school. Is the school using the latest and greatest technological resources and cutting-edge techniques? New tools and tech are being implemented all the time, and you need a school that will prepare you for a high-tech professional environment. This is something you can check on your physical tour of the facilities but be sure to ask about it, too. Getting an education at a top beauty school can really kickstart your career in a creative and challenging industry – so make sure you get everything out of this opportunity that you can. Jumping into the world of cosmetology can be a lot of fun, and it’s a career in which you can let your creative senses and your business savvy really shine. At Taylor Andrews we make it easy to get started. From hair design to master esthetics, our staff is dedicated to helping you reach your career goals. Take a look at our upcoming class dates and get more information about our beauty school. Not many students would think about it, but I think the article makes a fantastic point regarding whether or not a cosmetology school should bring in professional artists from over the world. After all, when you choose to attend beauty school you want to make sure you’re learning from the best. Ideally, your teachers should be certified to train you and you should regularly have exposure to professionals from the industry to see what it is like. Thanks for this advice for picking a good beauty school. I’m glad you said to look at the different courses that are offered. Perhaps it could be good to see how the curriculum differs in different schools just to maybe understand what kind of experience you will have. I just liked this article! Nowadays beauty field has the best carrier opportunities, so I and my friend decided to become leading beauticians but we both don’t know how to choose the right beauty school, within your article I got a clear idea about how to choose the right beauty school. Thanks for sharing.